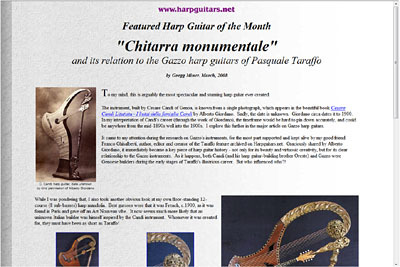 One of the more exciting harp guitar research projects continues to be the floor-standing harp-shaped guitars to come out of Genoa (refer to my 2008 web article, shown above). Among others, Alberto Giordano has been particularly interested and helpful in this investigation. 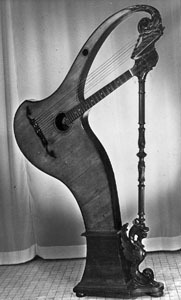 It has repercussions into many areas, including hollow-arm harp guitar “evolution” in Genoa – specifically, how Taraffo’s Gazzo harp guitar may have come about. The image in my article (top left in above screen shot) comes from Alberto, appearing in his wonderful book, Cesare Candi Litutista – I liutai della famiglia Candi. An additional image of a slightly different Candi specimen (note the soundholes) appears in the important book, Romolo Ferrari: e la chitarra in Italia nella prima meta del Novacento (image courtesy of editor Simona Boni). UPDATE January, 2016: We now believe this to be the same instrument, with parts of the top replaced. Besides this instrument, there are rumors of a similar instrument by a different maker in Milan, an unknown instrument in a private home in Pennsylvania, and of course, my own unlabeled mandolin variant. This is a “smoking gun” image (printed on half of an old postcard), found in an Italian fleamarket by Reidar. It answers several important questions, even though it may remain partially shrouded in mystery. First, let’s address Noceti himself. I had, and have, found few people familiar with him, other than his most famous pupil, Massimo Gasbarroni, who plays pieces by his teacher (and who assures me that, while Noceti had walls full of guitars and other instruments, there was never anything like this in evidence, nor was he ever told about it). Noceti, alert readers will remember, showed up out of the blue one day on (you guessed it:) Wikipedia, as one of the few historical “harp guitar players” of note (for a more accurate, and still incomplete list, see my own Encyclopedia). The Wiki entry stayed (and remains, for now), as it actually came with a valid reference – a 1903 newspaper clipping. Of course, I found it aggravating and unwarranted that someone (uncredited, as always) would arbitrarily add a “famous harp guitarist” based on a single news clipping, especially when the “guitharpe” in question is neither seen nor described, other than as “a combination of the guitar and the harp” (which a lot of instrument inventors have similarly claimed). Nevertheless, I’m not one to look a gift horse in the mouth, and dutifully added Noceti to my own encyclopedia (with a disclaimer about his unknown instrument), while beating the bushes for any further information about him. And then, thanks to Reidar’s rare postcard, we suddenly see his true Chitarpa! Look familiar? Yes, but look closely. It’s not a harp guitar. Oh, it’s definitely a spectacular “harp guitar in name only” simply by nature of its incredible and distinctive design (notwithstanding Noceti’s invented name). But it is still only a 6-string guitar, and Noceti only ever wrote for 6 strings. Meanwhile, what of the provenance of the instrument? As we can see from the newspaper clipping, Noceti was playing in Paris in March, 1903 on an instrument “of his own invention” named the “guitharpe” (chitarpa). I found very little on Noceti, but saw that he was in the Italian Guitarists Dictionary (nothing about a chitarpa), and had published some guitar pieces of his own. After finding Massimo through Google, he shared with me this rare document written by Benedetto Di Ponio (another occasional harp guitarist: see my encyclopedia), which he obtained from “Giuliano Balestra, his old collegue at the Conservatory”). In it, Di Ponio states that Noceti obtained a patent for his chitarpa in 1904, and describes the instrument. Noceti invents the concept of the harp-shaped, 6-string chitarpa, which he commissions Cesare Candi, or the Candi brothers, to build. Cesare Candi builds others, naturally adding sub-bass strings (since he and Oreste were already building simple theorboed harp guitars). Young Pasquale Taraffo sees these instruments, and comes up with his own design which increases the basses to 8, and adds a stand, so he can also play standing up, but eliminate the heavy, one-piece construction, and have an easier traveling instrument and stand. He enlists Settimio Gazzo to realize his instrument(s) and plays one to the end of his career. Interesting that if he knew the specific name of Noceti’s, Taraffo chose not to call his a “chitarpa” or some other fancy new word. Other questions remain: what happened to Noceti and/or his instrument during the early days of Taraffo and his later popularity? What audiences did he play the chitarpa for? Did the two young, and then older, men, ever meet? 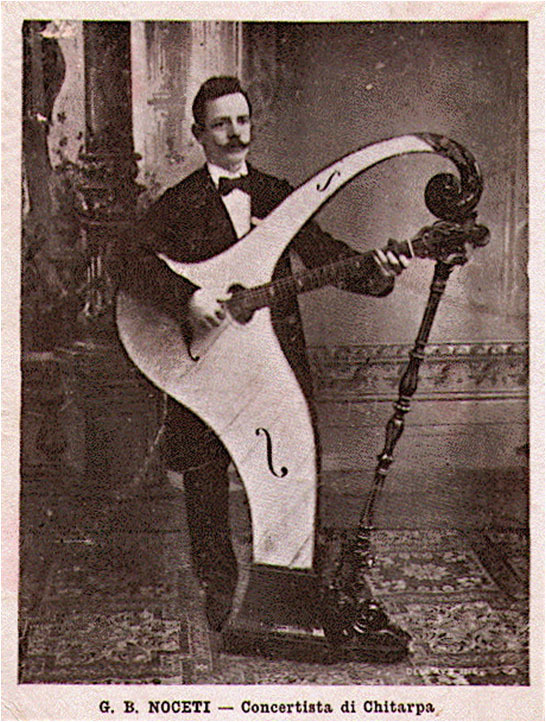 Fascinating harp guitar history, is it not?! I would be grateful if someone could try to translate the above Di Ponio document and the the short Dictionary entry (if legible enough). I will translate it if necessary. Thanks, Marco – yes, I had this, and think I got the gist, but would love a translation!